While dining at the Lion's Den with some fellow bloggers, I got a phone call. Turns out that I forgot that we were supposed to meet up with Costanza and Elaine for dinner. One look at the time, and I realize that I'd be eating again in 2.5 hours later. Doh! I was hoping to grab a "snack" at Ba Le. Well, that ain't gonna happen anymore! I ended up going for a haircut, then went home to pick up the family. So after a brief intermission, here I am eating again. Located right next to Samosa Garden, Da Rae Oak is not a very big restaurant. We were lucky to get a table for 8, as the place filled up pretty quick and was packed by the time we were eating. As with most Korean restaurants, our meal started with the complimentary Banchan consisting of stewed potatoes, sprouts, wakame, daikon and kimchi. Nothing particularly exciting or offensive, these little dishes did their job. 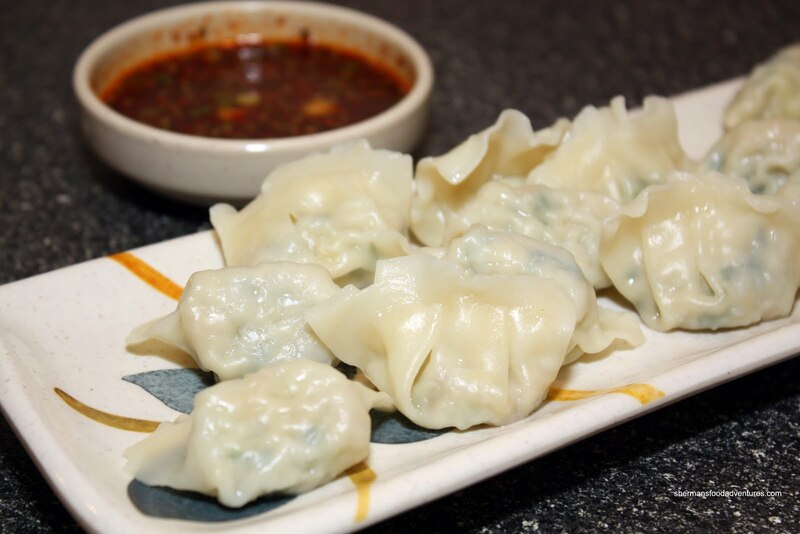 We started off with the Mul Mandu (steamed dumplings). These perfectly cooked little morsels were filled with pork and veggies encased in a thin dumpling skin. Dipped into the spicy, vinegary and sweet sauce, this dish was a winner. 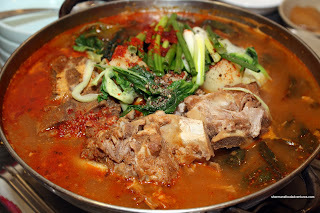 Up next was the Gam Ja Tang (pork bone soup). This was the soup for 2 version served on a portable burner. Is it just me or this soup in any shape or form grossly overpriced considering the raw materials? I realize there are quite a few examples of curiously expensive Korean dishes; but this one confuses me. 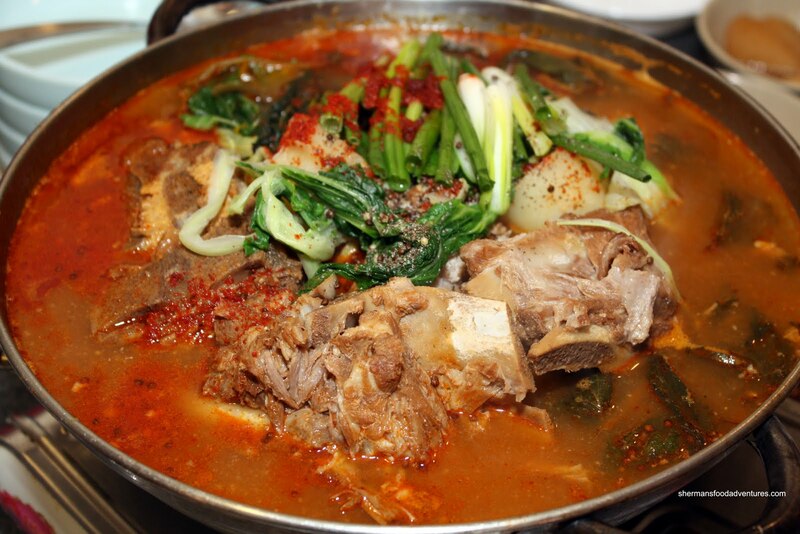 The pork neck bones used are generally quite inexpensive. However this large soup costs $19.50. The only thing that might explain the high pricing would be the amount of time required boiling the broth and thus softening the meat. With that being said, this type of long boiled soup is normally complimentary in Chinese restaurants. Okay, despite my ranting, the soup itself was quite good. The meat fell off the bone and had soaked up the flavour of the broth. The broth itself in turn had a nice body to it from the bones while exhibiting some spice. 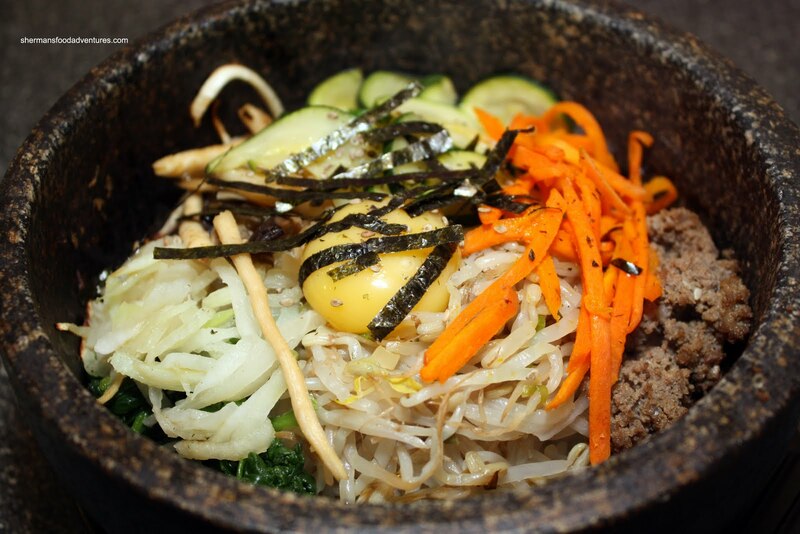 Bibimbap is such a simple dish; yet to me at least, oh so good especially served in a hot stone bowl (dolset). The ingredients were both plentiful and good while the rice was quite mushy. Even the sizzling hot stone didn't save it. Considering that I had to add the gochujang to it, it became even mushier. 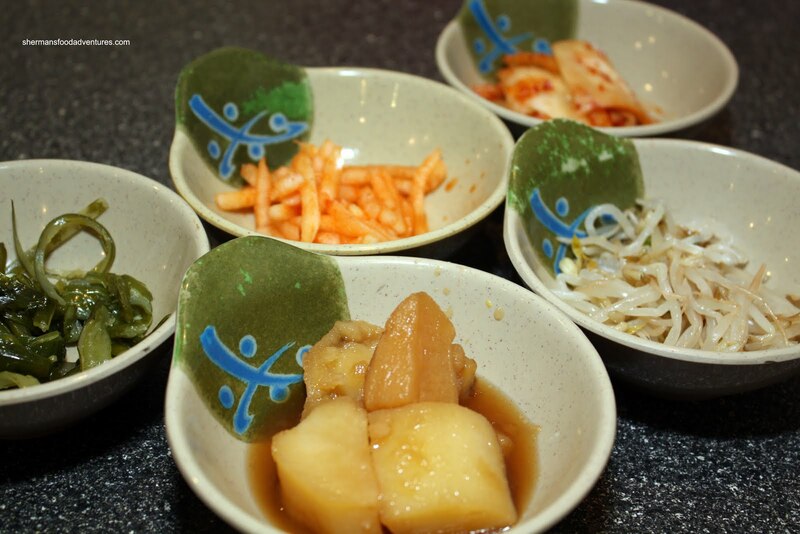 A dish that I have never personally ordered in a Korean restaurant, partly due to my preconceptions, is the Kan Poong Gi. It is essentially deep fried chicken in a sweet and hot sauce. To me it seems to be related to sweet and sour pork. When it arrived, it sure bore a striking resemblance with the fried pieces, peppers and pineapple. The only difference was the lighter colour of the sauce. I'm not sure about the spicy part; but it was sweet and a bit sour. It was alright; however nothing I'd order again. 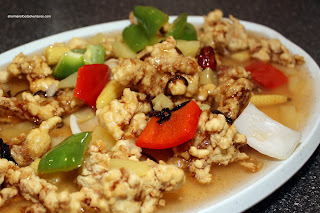 Nothing against this version of the dish in general, it's just too much like sweet and sour pork. Something that we always order by default at a Korean restaurant is the Japchae, even though it is another example of an expensive dish (which is mainly just noodles). We liked the japchae here. Consisting of a good amount of ingredients, it wasn't overly oily (it generally is due to the risk of the noodles sticking). 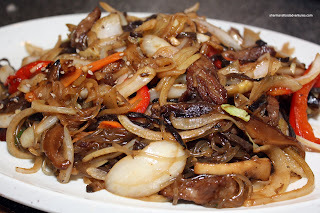 Flavourwise, there was a good amount of "wok hay" which translates into good caramelization. 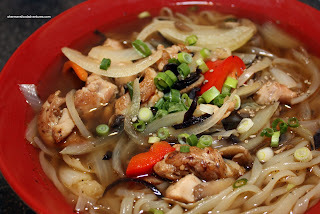 The last dish, Chicken Udon, was more for the kiddies. However, if you look at the picture, it doesn't resemble any udon I've ever encountered. But that wasn't a problem at all since the noodles were very good. Cooked al dente with a good amount of elasticity, these noodles had a nice "bite". The soup was had depth without being salty. It was flavourful and I really hope it wasn't MSG! Even the pieces of chicken were tasty. I probably ended up eating more of this than the kids. Don't worry, there was enough to go around, it was a big bowl! Actually, all the dishes were well-prepared and well-seasoned. Pretty solid food in my books. Mind you, like most Korean restaurants, the total bill wasn't cheap. Furthermore, service was extremely sparse despite being courteous when we got some. The evening menu has some interesting items, however I only go for lunch for their $5.95 lunch specials. At those prices, I don't think I would be satisfied when I can order a variety things at their lunch special prices. 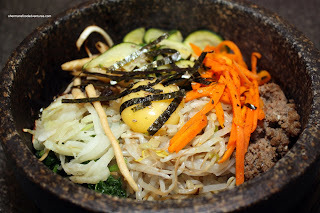 To me Da Rae Oak has more of a cafe feel rather than a restaurant atmosphere, so if I were to cough up more money for dinner, I would probably head over to Chosun, their sister restaurant next door. Also, their banchans are tastier. You don't need to go in a group for lunch. Usually it's just me, or me and my sis. Oh, Holly, no, I was referring to Sherman! Since he has been frequenting Korean places, I am starting to wonder if he ran out of Chinese places to try! Yeah, I know a lot of these places have lunch type specials; however, I want to try more dishes rather than just bi bim bap or sunduku. that is DEFINITELY not Kkan Poong Gi! even a korean (me) can see that that is just sweet & sour pork (tang-soo-yook)! Wow...wonder if there was a price difference... with the kkan-poong-gi you will the sliced red chili peppers and there are NO pineapples. Wow. they messed up. Lol! Is that all the panchan they gave you for eight people? Thanks Holly, will try Chosun next time! Kim, I love Korean food, you are right though, better with more numbers, can eat more dishes! Holly, I think Kim just wants variety or maybe company??? Jennifer, thank you for the confirmation. That was exactly like sweet n sour pork minus the red colour. I thought it was too similar! Hi FF, nope, they gave us twice the amount. I just took the picture of one portion.